Come join one of our most popular programs. L'il Diggers is a program for K-4th graders. 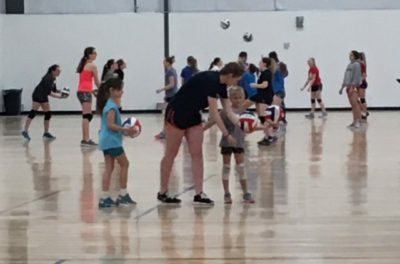 The Li’l Digger instructional sessions have proven to be a very successful style of teaching and training that will include fundamentals and also incorporate “mini” competitions that are a fun style of learning. The fundamentals we teach are passing, setting, serving (underhand and overhand), and spiking. We will then progress this from one-skill drills to two-skills, and then three-skills (pass-set-spike). When they are ready, we progress to small groups of 2, 3, or 4 players using 3 contacts per side. We believe this will help the Li’l Diggers with a very essential part of the game, ball control. If you miss a day of a session due to vacation or other obligations you can make it up in another session or on another day if that session offers one, always no charge for a make-up. Cost of each session is $70. This is for all 4 weeks within the session and includes a t-shirt.